Summer is winding down and it's almost back to school time! My August this year is a bit crazy! New baby,*******, my middle turned 8 and my second middle (still working out how to label these kids with the newest addition!) had a week of kindercamp! Whew! We are LDS (learn more here if you are interested :) ) and so when a child turns 8 they can be baptized a member of the Church of Jesus Christ of Latter-Day Saints. My middle chose to be and being my numbers boy (his birthday and birth weight were exactly the same!) we chose 8/10/18 for his baptism date. I knew it was coming and so I prepared ahead of time (well, a bit- avid procrastinator!) and I made some cupcake toppers for refreshments after. With a new baby in the house I knew I could at least pull off cupcakes and punch right?! Even if it all had to be boughten! So, now I am going to share the toppers with you! 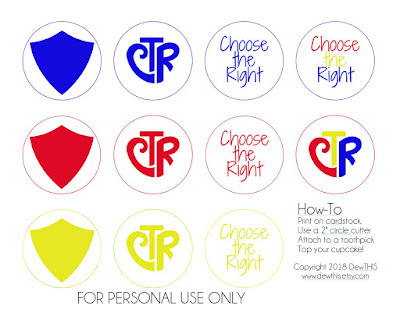 CTR is an acronym our church uses often that stands for "Choose the Right". I think it is such a great message for any child to learn! Enjoy!